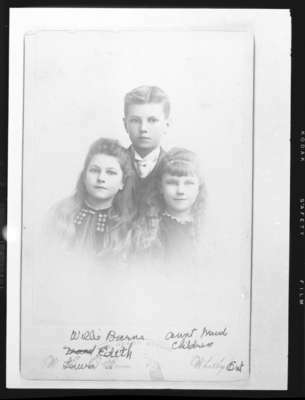 A black and white portrait photograph of Robert Barnes' children: Laura Gertrude, William Douglas and Edith May. Laura Gertrude Barnes was born at Whitby on July 26, 1880. She married Richard S. Cassels on February 16, 1926 at Whitby. She died on August 26, 1979 at Whitby. William Douglas Barnes was born at Whitby on August 10, 1879. He played Junior A Hockey as a young man in Whitby. He later became a commercial traveler with the Prairie City Oil and Gas Company and lived in Winnipeg and Saskatoon. He returned to Whitby after his retirement in 1938 and for more than 25 years was an officer in the Ontario County Court. He died at Whitby on January 5, 1974. Edith May Barnes was born at Whitby on June 24, 1886 and died on November 15, 1979. Laura Gertrude, William Douglas and Edith May are all buried at Union Cemetery, Oshawa.